A Fire accident was occur tonight at Kompleks Bukit Jambul. 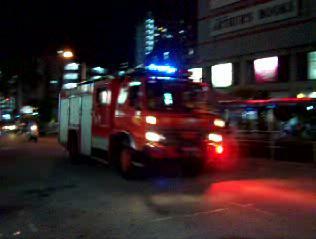 Fire alarm started to rangs around 10:30pm (not official) and I was mistook it as false alarm when I was to go outside KBJ shopping centre. From information I've got, a 2 month old metallic silver coloured KIA Spectra was on fire at 2nd Floor Parking. One fire engine (as in picture) from nearest station come to the rescue, and it takes around 30 minutes for them to put out the fire. Cause of the fire accident is still under 'bomba' investigation. My Internet Explorer got hijacked!